Speich MJR (2019). Quantifying and modeling water availability in temperate forests: a review of drought and aridity indices. iForest 12: 1-16. Climatic water availability is a major determinant of forest structure and composition, while drought events may severely impact forest dynamics. In recent decades, an increasing number of severe drought events has been reported in forests around the world. In the future, climate models project increasingly dry conditions in many temperate regions. Various tools have been applied to better understand the effects of drought on forests, such as dendrochronological analyses, climatic trend analyses and dynamic models. With these approaches, water availability is often summarized as a single scalar, termed a drought or aridity index. As droughts are complex phenomena, such indices are always associated with a loss of information. Many different such indices exist, and have been developed for various purposes. This review asks whether some of these indices are more suitable than others to quantify water availability in temperate forests. In a first step, the rationale and theoretical background of different drought indices are spelled out and compared among each other. Then, evaluations and intercomparisons of drought indices from the literature are reviewed. The implementation of drought indices in dynamic forest models is also discussed. Finally, two current research questions are identified: the role of dry air for physiological drought, and the suitability of various drought indices under climate change. It appears from this review that indices accounting for evaporative demand generally perform better than indices based on precipitation alone. When comparing sites with different edaphic conditions, indices accounting for soil moisture storage are more suitable. Nevertheless, results from intercomparisons show considerable divergence, and it is not possible to clearly favor one index. Furthermore, a differential response of tree species to different drought indices is often observed, although no clear pattern emerges from this comparison. More intercomparisons of indices, across climates and species, might provide valuable knowledge. Another key finding is that the properties of indices also depend on choices regarding, e.g., the calculation of evaporative demand, or the underlying water balance model. Reporting such methodological details could greatly increase the value of future evaluations of drought indices. On underestimation of global vulnerability to tree mortality and forest die-off from hotter drought in the Anthropocene. Ecosphere 6: 129. Managing stand density to enhance the adaptability of Scots pine stands to climate change: a modelling approach. Ecological Modelling 356: 141-150. Allometric trajectories and “stress”: a quantitative approach. Frontiers in Plant Science 7: 1681. Does water shortage generate water stress? An ecohydrological approach across Mediterranean plant communities. Functional Ecology 31: 1325-1335. Tree growth as affected by soil moisture availability. Soil Science Society of America Journal 28: 436-438. Different responses of multispecies tree ring growth to various drought indices across Europe. Dendrochronologia 44: 1-8. Climate and life. Academic Press, New York, USA, pp. 507. Improving the behaviour of forest gap models along drought gradients. Forest Ecology and Management 103: 247-263. Traditional and novel indicators of climate change impacts on European forest trees. Forests 8: 137. Extreme drought alters competitive dominance within and between tree species in a mixed forest stand. Functional Ecology 27: 1424-1435. Understanding plant responses to drought from genes to the whole plant. Functional Plant Biology 30: 239-264. The impacts of increasing drought on forest dynamics, structure, and biodiversity in the United States. Global Change Biology 22: 2329-2352. 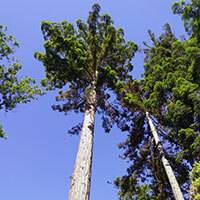 An empirical mixed model to quantify climate influence on the growth of Pinus halepensis Mill. stands in South-Eastern Spain. Forest Ecology and Management 284: 59-68. Survival functions for boreal tree species in northwestern North America. Forest Ecology and Management 402: 177-185. Coupling a water balance model with forest inventory data to predict drought stress: the role of forest structural changes vs. climate changes. Agricultural and Forest Meteorology 213: 77-90. Yield response to water. FAO irrigation and drainage paper 33, Food and Agriculture Organization of the United Nations, Rome, Italy, pp. 201. Ecological optimality in water-limited natural soil-vegetation systems: 1. Theory and hypothesis. Water Resources Research 18: 325-340. Short- and long-term efficacy of forest thinning to mitigate drought impacts in mountain forests in the European Alps. Ecological Applications 25: 1083-1098. Application of a new aridity index in Hungarian forestry practice. Idojaras 115: 205-216. Assessing various drought indicators in representing summer drought in boreal forests in Finland. Hydrology and Earth System Sciences 20: 175-191. Concepts in plant stress physiology. Application to plant tissue cultures. Plant Growth Regulation 37: 263-285. Leaf area of mature northwestern coniferous forests: relation to site water balance. Ecology 58: 893-899. Impacts of precipitation variability on plant species and community water stress in a temperate deciduous forest in the central US. Agricultural and Forest Meteorology 217: 120-136. Modeling forest mortality caused by drought stress: implications for climate change. Ecosystems 16: 60-74. Implications of mechanistic modeling of drought effects on growth and competition in forest landscape models. Ecosphere 7: e01253. A review of twentieth-century drought indices used in the United States. Bulletin of the American Meteorological Society 83: 1149-1165. An ecosystem model-based estimate of changes in water availability differs from water proxies that are commonly used in species distribution models. Global Ecology and Biogeography 18 3: 304-313. A simple soil moisture index for representing multi-year drought impacts on aspen productivity in the western Canadian interior. Agricultural and Forest Meteorology 178- 179: 173-182. Plant responses to water stress. Annual Review of Plant Physiology 24 (1): 519-570. Special paper: Modelling present and potential future ranges of some European higher plants using climate response surfaces. Journal of Biogeography 22: 967-1001. Comparing response of Pinus edulis tree-ring growth to five alternate moisture indices using historic meteorological data. Journal of Arid Environments 72: 350-357. A generalised model of forest productivity using simplified concepts of radiation-use efficiency, carbon balance and partitioning. Forest Ecology and Management 95: 209-228. Soil and atmospheric water deficits and the distribution of New Zealand’s indigenous tree species. Functional Ecology 15: 233-242. Feedback between structured vegetation and soil water in a changing climate: a simulation study. In: “Climatic Change: Implications for the Hydrological Cycle and for Water Management” (Beniston M, Beniston M eds). Advances in Global Change Research, vol. 10, Springer, Dordrecht, Netherlands, pp. 349-377. Site and weather effects in allometries: a simple approach to climate change effect on pines. Forest Ecology and Management 215: 251-270. The interdependence of mechanisms underlying climate-driven vegetation mortality. Trends in Ecology and Evolution 26: 523-532. The relationship of drought frequency and duration to time scales. Proceedings of the “8th Conference on Applied Climatology”. Anaheim (CA, USA) 17-22 Jan 1993. American Meteorological Society, Anaheim, CA, USA, pp. 179-184. Potential evapotranspiration and continental drying. Nature Climate Change 6: 946-949. Forward modeling of tree-ring width improves simulation of forest growth responses to drought. Agricultural and Forest Meteorology 221: 13-33. Evaporation and environment. Symposia of the Society for Experimental Biology 19: 205-234. Water stress integral-a link between short-term stress and long-term growth. Tree Physiology 4: 315-323. Testing a theoretical climate-soil-leaf area hydrologic equilibrium of forests using satellite data and ecosystem simulation. Agricultural and Forest Meteorology 44: 245-260. The increasing importance of atmospheric demand for ecosystem water and carbon fluxes. Nature Climate Change 6: 1023-1027. Meteorological drought. Research Paper no. 45, US Weather Bureau, Washington, DC, USA, pp. 58. An ecohydrological perspective on drought-induced forest mortality. Journal of Geophysical Research: Biogeosciences 119: 965-981. A belowground perspective on the drought sensitivity of forests: towards improved understanding and simulation. Forest Ecology and Management 380: 309-320. Soil water balance performs better than climatic water variables in tree species distribution modelling: soil water balance improves tree species distribution models. Global Ecology and Biogeography 22: 470-482. Plants in water-controlled ecosystems: active role in hydrologic processes and response to water stress: III. Vegetation water stress. Advances in Water Resources 24: 725-744. Changes in the forest ecosystems in areas impacted by aridization in south-western Romania. Journal of Environmental Health Science and Engineering 12: 2. On the assessment of surface heat flux and evaporation using large-scale parameters. Monthly Weather Review 100: 81-92. Enhancing gap model accuracy by modeling dynamic height growth and dynamic maximum tree height. Ecological Modelling 232: 133-143. Coupling of environment to plant response: a simulation model of transpiration. Ecology 55: 62-72. Incorporating the effects of changes in vegetation functioning and CO2 on water availability in plant habitat models. Biology Letters 4: 556-559. Drought stress distribution responses of continental beech forests at their xeric edge in Central Europe. Forests 7: 298. The importance of interception and why we should delete the term evapotranspiration from our vocabulary. Hydrological Processes 18: 1507-1511. Application of a hybrid forest growth model to evaluate climate change impacts on productivity, nutrient cycling and mortality in a montane forest ecosystem. PLoS ONE 10: e0135034. Assessing temperature-based PET equations under a changing climate in temperate, deciduous forests. Hydrological Processes 25: 1466-1478. Water use by perennial evergreen plant communities in Australia and Papua New Guinea. Australian Journal of Botany 20: 273-299. Climatic control of vegetation distribution: the role of the water balance. The American Naturalist 135: 649-670. Sensitivity of forest water balance and physiological drought predictions to soil and vegetation parameters - a model-based study. Environmontal Modelling and Software 102: 213-232. Climate change impact assessment - a simulation experiment with Norway spruce for a forest district in Central Europe. Ecological Modelling 346: 30-47. Overstorey-understorey interactions intensify after drought-induced forest die-off: long-term effects for forest structure and composition. Ecosystems 21: 723-739. The hydraulic architecture of trees and other woody plants. New Phytologist 119: 345-360. The sensitivity of the PDSI to the Thornthwaite and Penman-Monteith parameterizations for potential evapotranspiration. Journal of Geophysical Research 116: 4025-4048. Performance of drought indices for ecological, agricultural, and hydrological applications. Earth Interactions 16: 1-27. Diverse responses of forest growth to drought time-scales in the Northern Hemisphere: response of forest growth to drought. Global Ecology and Biogeography 23: 1019-1030. Xylem cavitation and embolism in plants living in water-limited ecosystems. In: “Plant Responses to Drought Stress” (Aroca R ed). Springer, Berlin, Heidelberg, Germany. Comparison of drought stress indices in beech forests: a modelling study. iForest - Biogeosciences and Forestry 9: 635-642. 3-PG simulations of young ponderosa pine plantations under varied management intensity: why do they grow so differently? Forest Ecology and Management 313: 69-82. A self-calibrating Palmer Drought Severity Index. Journal of Climate 17: 2335-2351. Dependence of trends in and sensitivity of drought over China (1961-2013) on potential evaporation model. Geophysical Research Letters 43: 206-213. A rational function approach for estimating mean annual evapotranspiration. Water Resources Research 40: pp. 14. A simulation study to analyse the relations between crown condition and drought in Switzerland. Forest Ecology and Management 188: pp. 25-38. Climatic extremes improve predictions of spatial patterns of tree species. Proceedings of the National Academy of Sciences USA 106: 19723-19728. Modeling tree water deficit from microclimate: an approach to quantifying drought stress. Tree Physiology 25: 147-156.